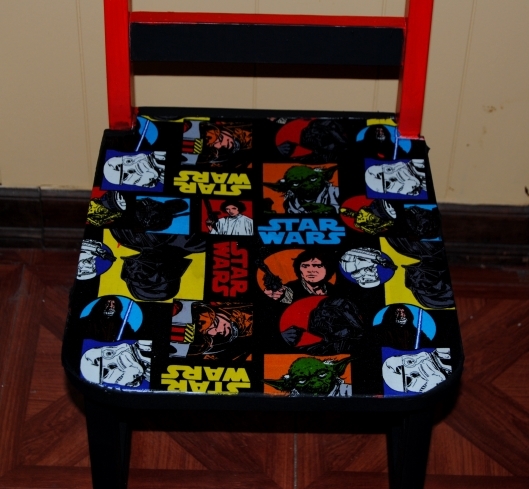 I was in Joann Fabric recently and came across some great Star Wars themed fabric. They were in the midst of having a huge fabric sale and I jumped at the chance to purchase something unique and fun at a discounted price. When I brought the fabric to the counter to have it measured and cut, the clerk informed me that their was a larger scrap piece she could sell me for an additional half off! It was my lucky day as I really only needed a half yard. This piece was large enough to use for additional projects, and I jumped at the chance to buy it. Two other fabrics I purchased also had discounted scrap pieces. It was my lucky day! Over a yard of fabric Star Wars fabric cost a mere $5.30! I had picked up two kids chairs during a furniture sale (shown above) at a local Goodwill store. 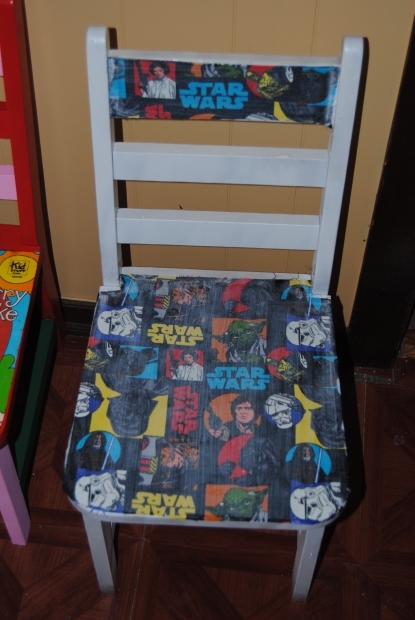 My first project to utilize one of these chairs was for a Strawberry Shortcake themed guest blogger project celebrating Geek Month on Cheeky Geeks Blog. I primed both chairs with a spray on white latex primer, and this chair sat for quite sometime unfinished. 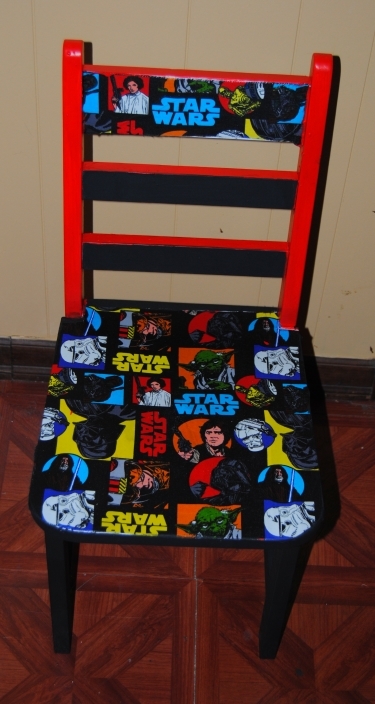 It seemed a perfect fit for the Star Wars fabric. My husband and I are like many our age, huge fan “geeks” when it comes to Star Wars. I was more than happy to base a kids chair on such a fun topic from our youth. 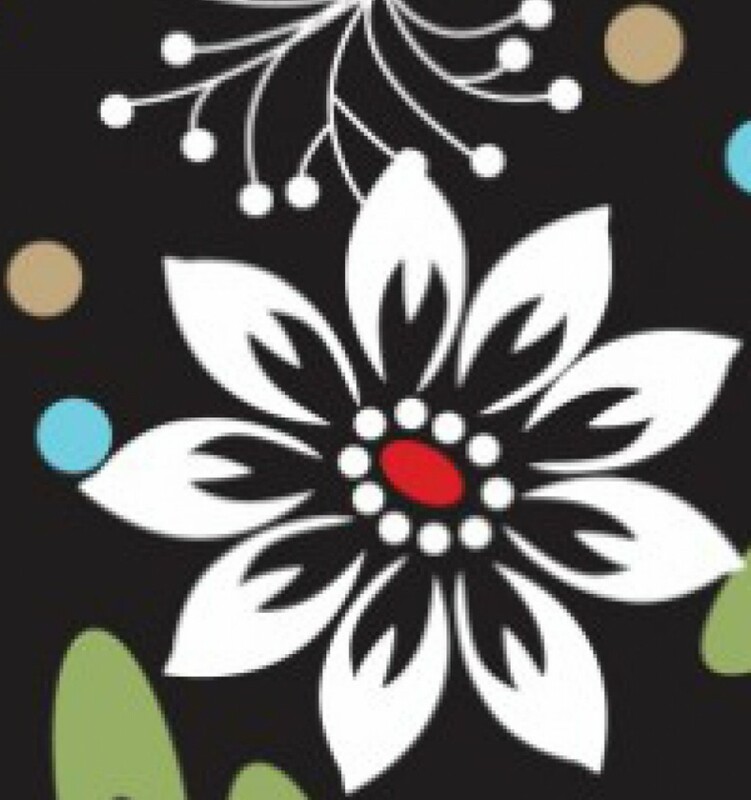 I flipped the chair over on to a table and laid the chair seat upon the flip side of the fabric, tracing carefully with a black marker. 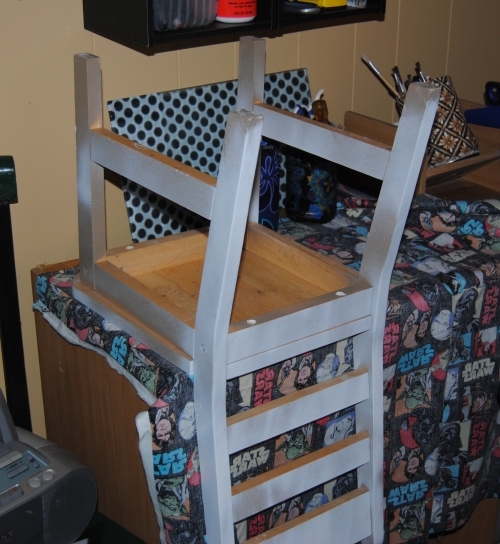 I carefully cut out the piece of fabric, along with a smaller sized piece I would use for the chair back. I applied Mod Podge to the chair seat surface with a large foam craft brush. I then carefully laid the cut fabric on the chair with my hands smoothing it out to prevent wrinkles. I trimmed the back of the fabric carefully where the seat back and chair back met. This enabled me to cover the seat with as much fabric as possible. I repeated the same steps to apply the smaller piece of fabric to the chair back. Once dry, I covered the fabric over top with Mod Podge, and allowed it to dry. 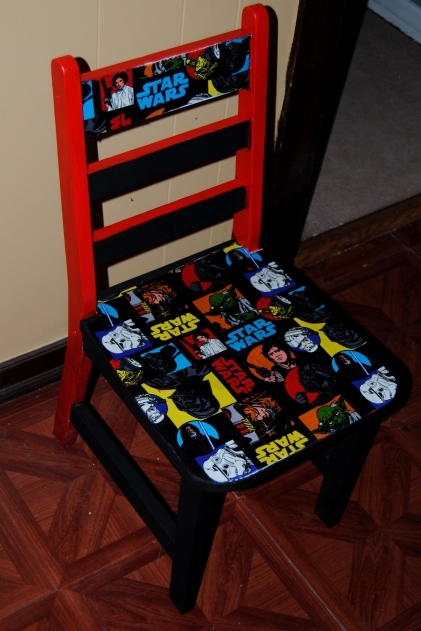 I then hand-painted the chair with red and black acrylic paint. 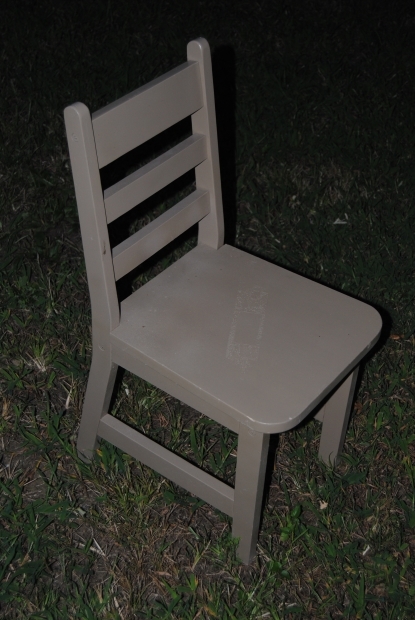 Like the first chair, it required quite a few coats of paint. Once dry, I painted on a coat of Mod Podge to seal it.